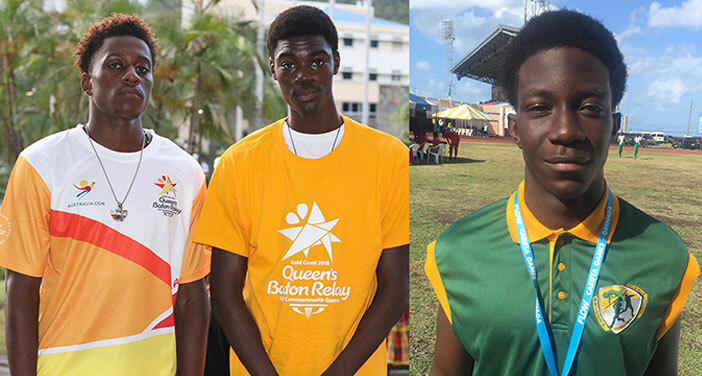 For the first time since the territory’s athletes began attending schools in the United States in 1976, three male athletes who have contributed to the 4x100m and 4x400m Relay records this season, are off to colleges and university, marking the first time that many have gone off at the same time. Long and Triple Jumper Akeem Bradshaw who anchored the 4x100m Relay to 40.54 seconds will attend Iowa Central College. Rikkoi Brattwaite who replaced Bradshaw on the 4x100m Relay anchor leg and helped the team to break 40 seconds for the first time with a time of 39.78 seconds and lowered the 100m Jr. record to 10.43 seconds, is attending Indiana. Adriano Gumbs who contributed to the 4x400m Relay that broke the 1984 Olympic Games team mark of 3 minutes 11.89 seconds with a third leg carry on the team that ran 3:11.03, will take his talents to Barton County Community College. Bradshaw, who’s planning to study in the technical area, said he’s looking forward to improving his jumping skills as well as his academics. He has jumped 7.45m in the Long Jump and 15.46m in the Triple Jump and is looking for major improvements in both events. Bradshaw says he favors the Triple Jump over the Long Jump. Gumbs who has a 48.62 seconds best in the 400m, said he’s looking to excel in his athletic career and get an academic scholarship and want to major in insurance and business administration finance. Brathwaite has been the BVI’s most consistent 100m Jr. athlete in its history with several races this season between 10.43 and 10.48 seconds and wanted to get into the 10.3s this year. He’s eyeing improvements in college and says his start has to improve. Outside of competition, he said he expects to meet a diverse community, where it’s easy for him to interact with different people. Meanwhile, sprinter L’T’Sha Fahie, will join Tarika “Tinkerbell” Moses at College of the Sequoias, in California. Fahie lowered her 100m personal best to 11.67 seconds this season.